Rubber is an elastic, hydrocarbon polymer that occurs as a milky, colloidal suspension (known as latex) in the sap of several varieties of plants. Rubber can also be produced synthetically. 3.1 Why does rubber have elasticity? Unfortunately, the history of rubber has a dark side as well. About one hundred years ago, millions of Africans died in the Congo Free State as a result of lust for rubber and rubber profits. 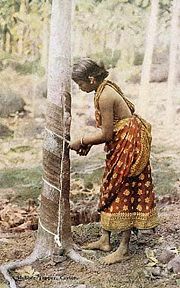 The major commercial source of natural latex used to create rubber is the Para rubber tree, Hevea brasiliensis (Euphorbiaceae). This is largely because it responds to wounding by producing more latex. In 1876, Henry Wickham gathered thousands of seeds of this plant from Brazil, and they were germinated in Kew Gardens, England. The seedlings were then sent to Colombo, Indonesia, Singapore, and British Malaya. Malaya later became the biggest producer of rubber. Other plants containing latex include figs (Ficus elastica), euphorbias, and the common dandelion. Although these have not been major sources of rubber, Germany attempted to use such sources during World War II when it was cut off from rubber supplies. These attempts were later supplanted by the development of synthetic rubber. Its density is about 920 kilograms/meter3. In places like Kerala, where coconuts grow in abundance, half of a coconut shell is used as a container to collect the latex. The shells are attached to the tree by a short, sharp stick, and the latex drips down into it overnight. This usually produces latex up to a level of half to three quarters of the shell. The latex from multiple trees is then poured into flat pans, and this is mixed with formic acid, which serves as a coagulant. After a few hours, the very wet sheets of rubber are wrung out by putting them through a press, then sent to factories where vulcanization and further processing is done. Today, Asia is the main source of natural rubber. Over half of the rubber used today is synthetic, but several million tons of natural rubber are still produced annually, and is still essential for some industries, including automotive and military. Hypoallergenic rubber can be made from guayule. Natural rubber is often vulcanized, a process by which the rubber is heated and sulfur, peroxide or bisphenol are added to improve resilience and elasticity, and to prevent it from deteriorating. Vulcanization greatly improved the durability and utility of rubber from the 1830s on. The successful development of vulcanization is most closely associated with Charles Goodyear. Carbon black is often used as an additive to rubber to improve its strength, especially in vehicle tires. In its native regions of Central America and South America, rubber has been collected for a long time. The Mesoamerican civilizations used rubber mostly from the plant species known as Castilla elastica. The Ancient Mesoamericans had a ball game using rubber balls, and a few Pre-Columbian rubber balls have been found (always in sites that were flooded under fresh water), the earliest dating to about 1600 B.C.E. According to Bernal Díaz del Castillo, the Spanish conquistadores were so astounded by the vigorous bouncing of the rubber balls of the Aztecs that they wondered if the balls were enchanted by evil spirits. The Maya also made a type of temporary rubber shoe by dipping their feet into a latex mixture. Rubber was used in various other contexts as well, such as for strips to hold stone and metal tools to wooden handles, and padding for the tool handles. While the ancient Mesoamericans did not know about vulcanization, they developed organic methods of processing the rubber with similar results, mixing the raw latex with various saps and juices of other vines, particularly Ipomoea alba, a species of morning glory. In Brazil, the natives understood the use of rubber to make water-resistant cloth. One story says that the first European to return to Portugal from Brazil with samples of such water-repellant, rubberized cloth so shocked people that he was brought to court on the charge of witchcraft. The first reference to rubber in England appears to be in 1770, when Joseph Priestley observed that a piece of the material was extremely good for rubbing out pencil marks on paper, hence the name "rubber." Around the same time, Edward Nairne began selling cubes of natural rubber from his shop at 20 Cornhill in London. The cubes, meant to be erasers, sold for the astonishingly high price of three shillings per half-inch cube. The para rubber tree initially grew in South America, where it was the main source of the limited amount of latex rubber consumed during much of the nineteenth century. About one hundred years ago, the Congo Free State in Africa was a significant source of natural rubber latex, mostly gathered by forced labor. The Congo Free State was forged and ruled as a personal colony by the Belgian King Leopold II. Millions of Africans died there, as a result of lust for rubber and rubber profits. After repeated efforts, rubber was successfully cultivated in Southeast Asia, where it is now widely grown. In the mid-nineteenth century rubber was a novelty material, but it did not find much application in the industrial world. It was used first as erasers, and then as medical devices for connecting tubes and for inhaling medicinal gases. With the discovery that rubber was soluble in ether, it found applications in waterproof coatings, notably for shoes and soon after this, the rubberized Mackintosh coat became very popular. Rubber exhibits unique physical and chemical properties. Aside from a few natural product impurities, natural rubber is essentially a polymer of isoprene units, a hydrocarbon diene monomer. Synthetic rubber can be made as a polymer of isoprene or various other monomers. Rubber is believed to have been named by Joseph Priestley, who discovered in 1770 that dried latex rubbed out pencil marks. The material properties of natural rubber make it an elastomer and a thermoplastic. Rubber's stress-strain behavior exhibits the Mullins effect, the Payne effect and is often modeled as hyperelastic. Why does rubber have elasticity? In most elastic materials, such as metals used in springs, the elastic behavior is caused by bond distortions. When stress is applied, bond lengths deviate from the (minimum energy) equilibrium and strain energy is stored electrostatically. Rubber is often assumed to behave in the same way, but it turns out this is a poor description. Rubber is a curious material because, unlike metals, strain energy is stored thermally, as well as electrostatically. In its relaxed state rubber consists of long, coiled-up polymer chains that are interlinked at a few points. Between a pair of links each monomer can rotate freely about its neighbor. This gives each section of chain leeway to assume a large number of geometries, like a very loose rope attached to a pair of fixed points. At room temperature rubber stores enough kinetic energy so that each section of chain oscillates chaotically, like the above piece of rope being shaken violently. When rubber is stretched the "loose pieces of rope" are taut and thus no longer able to oscillate. Their kinetic energy is given off as excess heat. Therefore, the entropy decreases when going from the relaxed to the stretched state, and it increases during relaxation. This change in entropy can also be explained by the fact that a tight section of chain can fold in fewer ways (W) than a loose section of chain, at a given temperature (nb. entropy is defined as S=k*ln(W)). Relaxation of a stretched rubber band is thus driven by an increase in entropy, and the force experienced is not electrostatic, rather it is a result of the thermal energy of the material being converted to kinetic energy. Rubber relaxation is endothermic. The material undergoes adiabatic cooling during contraction. This property of rubber can easily be verified by holding a stretched rubber band to your lips and relaxing it. Stretching of a rubber band is in some ways equivalent to the compression of an ideal gas, and relaxation in equivalent to its expansion. Note that a compressed gas also exhibits "elastic" properties, for instance inside an inflated car tire. The fact that stretching is equivalent to compression may seem somewhat counter-intuitive, but it makes sense if rubber is viewed as a one-dimensional gas. Stretching reduces the "space" available to each section of chain. Vulcanization of rubber creates more disulfide bonds between chains so it makes each free section of chain shorter. The result is that the chains tighten more quickly for a given length of strain. This increases the elastic force constant and makes rubber harder and less extendable. When cooled below the glass transition temperature, the quasi-fluid chain segments "freeze" into fixed geometries and the rubber abruptly loses its elastic properties, though the process is reversible. This is a property it shares with most elastomers. At very cold temperatures rubber is actually rather brittle; it will break into shards when struck. This critical temperature is the reason that winter tires use a softer version of rubber than normal tires. The failing rubber seals that contributed to the cause of the space shuttle Challenger disaster were thought to have cooled below their critical temperature. The disaster happened on an unusually cold day. Synthetic rubber is made through the polymerization of a variety of monomers to produce polymers. These form part of a broad study covered by polymer science and rubber technology. Its scientific name is polyisoprene. Synthetic rubber is any type of artificially made polymeric material that acts as an elastomer. An elastomer is a material with the mechanical (or material) property that it can undergo much more elastic deformation under stress than most materials and still return to its previous size without permanent deformation. Synthetic rubber serves as a substitute for natural rubber in many cases, especially when improved material properties are needed. Natural rubber coming from latex is mostly polymerized isoprene with a small percentage of impurities in it. This will limit the range of properties available to it. Also, there are limitations on the proportions of cis and trans double bonds resulting from methods of polymerizing natural latex. This also limits the range of properties available to natural rubber, although addition of sulfur and vulcanization are used to improve the properties. However, synthetic rubber can be made from the polymerization of a variety of monomers including isoprene (2-methyl-1,3-butadiene), 1,3-butadiene, chloroprene (2-chloro-1,3-butadiene), and isobutylene (methylpropene) with a small percentage of isoprene for cross-linking. Furthermore, these and other monomers can be mixed in various desirable proportions to be copolymerized for a wide range of physical, mechanical, and chemical properties. The monomers can be produced pure and addition of impurities or additives can be controlled by design to give optimal properties. Polymerization of pure monomers can be better controlled to give a desired proportion of cis and trans double bonds. An urgent need for synthetic rubber that is derived from widely distributed feedstocks grew out of the expanded use of motor vehicles, and particularly motor vehicle tires, starting in the 1890s. Political problems that resulted from great fluctuations in the cost of natural rubber led to enactment of the Stevenson Act in 1921. This act essentially created a cartel which supported rubber prices by regulating production (see OPEC). By 1925 the price of natural rubber had increased to the point that companies such as DuPont were exploring methods of producing synthetic rubber to compete with natural rubber. In the case of Dupont the effort lead to the discovery of Neoprene which is a synthetic rubber that is too expensive to be used in tires, but has some very desirable properties that make it possible to use rubber in applications that would be unsuitable for natural rubber. Vulcanization, or curing of rubber, is a chemical process in which individual polymer molecules are linked to other polymer molecules by atomic bridges. The end result is that the springy rubber molecules become cross-linked to a greater or lesser extent. This makes the bulk material harder, much more durable and also more resistant to chemical attack. It also makes the surface of the material smoother and prevents it from sticking to metal or plastic chemical catalysts. This heavily cross-linked polymer has strong covalent bonds, with strong forces between the chains, and is therefore an insoluble and infusible, thermosetting polymer or thermoset. The process is named after Vulcan, the Roman god of fire. Uncured natural rubber will begin to deteriorate within a few days, gradually breaking down into a wet crumbly mess. The process of perishing partly consists of proteins being broken down (much as milk proteins do) and also of the large rubber molecules breaking up as they oxidize in the air due to oxygen molecules attacking the double bonds. Rubber that has been inadequately vulcanized also may perish, but more slowly. The process of perishing is encouraged by long exposure to sunlight, and especially to ultraviolet radiation. Vulcanization is generally considered to be an irreversible process (see below), similar to other thermosets and must be contrasted strongly with thermoplastic processes (the melt-freeze process) which characterize the behavior of most modern polymers. This irreversible cure reaction defines cured rubber compounds as thermoset materials, which do not melt on heating, and places them outside the class of thermoplastic materials (like polyethylene and polypropylene). This is a fundamental difference between rubbers and thermoplastics, and sets the conditions for their applications in the real world, their costs, and the economics of their supply and demand. Usually, the actual chemical cross-linking is done with sulfur, but there are other technologies, including peroxide-based systems. The combined cure package in a typical rubber compound comprises the cure agent itself, (sulfur or peroxide), together with accelerators and retarding agents. Along the rubber molecule, there are a number of sites which are attractive to sulfur atoms. These are called cure sites. During vulcanization the eight-membered ring of sulfur breaks down in smaller parts with varying numbers of sulfur atoms. These parts are quite reactive. At each cure site on the rubber molecule, one or more sulfur atoms can attach, and from there a sulfur chain can grow until it eventually reaches a cure site on another rubber molecule. These sulfur bridges are typically between two and ten atoms long. Contrast this with typical polymer molecules in which the carbon backbone is many thousands of atomic units in length. The number of sulfur atoms in a sulfur crosslink has a strong influence on the physical properties of the final rubber article. Short sulfur crosslinks, with just one or two sulfur atoms in the crosslink, give the rubber a very good heat resistance. Crosslinks with higher number of sulfur atoms, up to six or seven, give the rubber very good dynamic properties but with lesser heat resistance. Dynamic properties are important for flexing movements of the rubber article, e.g., the movement of a side-wall of a running tire. Without good flexing properties these movements will rapidly lead to formation of cracks and, ultimately, to failure of the rubber article. It is very flexible and water resistant. Most textbooks have it that Charles Goodyear (1800–1860) was first to use sulfur to vulcanize rubber. However we know today that ancient Mesoamericans achieved the same results in 1600 B.C.E. . Depending on what you read, the Goodyear story is one of either pure luck or careful research. Goodyear insists that it was the latter, though many contemporaneous accounts indicate the former. Goodyear claimed that he discovered sulfur-based vulcanization in 1839, but did not patent the invention until June 15, 1844, and did not write the story of the discovery until 1853 in his autobiographical book Gum-Elastica. Meanwhile, Thomas Hancock (1786-1865), a scientist and engineer, patented the process in the UK on November 21, 1843, eight weeks before Goodyear applied for his own UK patent. The Goodyear Tire and Rubber Company adopted the Goodyear name because of its activities in the rubber industry, but it has no other links to Charles Goodyear and his family. ... The inventor made some experiments to ascertain the effect of heat on the same compound that had decomposed in the mail-bags and other articles. He was surprised to find that the specimen, being carelessly brought into contact with a hot stove, charred like leather. Goodyear goes on to describe how he attempted to call the attention of his brother and other workers in the plant who were familiar with the behavior of dissolved rubber, but they dismissed his appeal as unworthy of their attention, believing it to be one of the many appeals he made to them on account of some strange experiment. Goodyear claims he tried to tell them that dissolved rubber usually melted when heated excessively, but they still ignored him. He directly inferred that if the process of charring could be stopped at the right point, it might divest the gum of its native adhesiveness throughout, which would make it better than the native gum. Upon further trial with heat, he was further convinced of the correctness of this inference, by finding that the India rubber could not be melted in boiling sulfur at any heat ever so great, but always charred. He made another trial of heating a similar fabric before an open fire. The same effect, that of charring the gum, followed; but there were further and very satisfactory indications of success in producing the desired result, as upon the edge of the charred portion appeared a line or border, that was not charred, but perfectly cured. Goodyear then goes on to describe how he moved to Woburn, Massachusetts and carried out a series of systematic experiments to discover the right conditions for curing rubber. ...On ascertaining to a certainty that he had found the object of his search and much more, and that the new substance was proof against cold and the solvent of the native gum, he felt himself amply repaid for the past, and quite indifferent to the trials of the future. Goodyear never made any money out of his invention. He pawned all his family's possessions in an effort to raise money, but on July 1, 1860, he died with debts of over $200,000. Whatever the true history, the discovery of the rubber-sulfur reaction revolutionized the use and applications of rubber, and changed the face of the industrial world. Up to that time, the only way to seal a small gap on a rotating machine, or ensure that the fuel used to power that machine (usually steam) in a cylinder applied its force to the piston with minimal leakage, was by using leather soaked in oil. This was acceptable up to moderate pressures, but above a certain point, machine designers had to compromise between the extra friction generated by packing the leather ever more tightly, or face greater leakage of the precious steam. Vulcanized rubber offered the ideal solution. With vulcanized rubber, engineers had a material which could be shaped and formed to precise shapes and dimensions, and which would accept moderate to large deformations under load and recover quickly to its original dimensions once the load was removed. These, combined with good durability and lack of stickiness, are the critical requirements for an effective sealing material. Further experiments in the processing and compounding of rubber were carried out, mostly in the UK by Hancock and his colleagues. These led to a more repeatable and stable process. In 1905, however, George Oenslager discovered that a derivative of aniline called thiocarbanilide was able to accelerate the action of sulfur on the rubber, leading to much shorter cure times and reduced energy consumption. This work, though much less well-known, is almost as fundamental to the development of the rubber industry as that of Goodyear in discovering the sulfur cure. Accelerators made the cure process much more reliable and more repeatable. One year after his discovery, Oenslager had found hundreds of potential applications for his additive. Thus, the science of accelerators and retarders was born. An accelerator speeds up the cure reaction, while a retarder delays it. In the subsequent century, various chemists have developed other accelerators, and so-called ultra-accelerators, that make the reaction very fast, and are used to make most modern rubber goods. The rubber industry has been researching the devulcanization of rubber for many years. The main difficulty in recycling rubber has been devulcanizing the rubber without compromising its desirable properties. The process of devulcanization involves treating rubber in granular form with heat and/or softening agents in order to restore its elastic qualities, in order to enable the rubber to be reused. Several experimental processes have achieved varying degrees of success in the laboratory, but have been less successful when scaled up to commercial production levels. Also, different processes result in different levels of devulcanization: for example, the use of a very fine granulate and a process that produces surface devulcanization will yield a product with some of the desired qualities of unrecycled rubber. The rubber recycling process begins with the collection and shredding of discarded tires. This reduces the rubber to a granular material, and all the steel and reinforcing fibers are removed. After a secondary grinding, the resulting rubber powder is ready for product remanufacture. However, the manufacturing applications that can utilize this inert material are restricted to those which do not require its vulcanization. In the rubber recycling process, devulcanization begins with the delinking of the sulfur molecules from the rubber molecules, thereby facilitating the formation of new cross-linkages. Two main rubber recycling processes have been developed: the modified oil process and the water-oil process. With each of these processes, oil and a reclaiming agent are added to the reclaimed rubber powder, which is subjected to high temperature and pressure for a long period (5-12 hours) in special equipment and also requires extensive mechanical post-processing. The reclaimed rubber from these processes has altered properties and is unsuitable for use in many products, including tires. Typically, these various devulcanization processes have failed to result in significant devulcanization, have failed to achieve consistent quality, or have been prohibitively expensive. In the mid-1990s, researchers at the Guangzhou Research Institute for the Utilization of Reusable Resources in China patented a method for the reclamation and devulcanizing of recycled rubber. Their technology, known as the AMR Process, is claimed to produce a new polymer with consistent properties that are close to those of natural and synthetic rubber, and at a significantly lower potential cost. The AMR Process exploits the molecular characteristics of vulcanized rubber powder in conjunction with the use of an activator, a modifier and an accelerator reacting homogeneously with particles of rubber. The chemical reaction that occurs in the mixing process facilitates the delinking of the sulfur molecules, thereby enabling the characteristics of either natural or synthetic rubber to be recreated. A mixture of chemical additives is added to the recycled rubber powder in a mixer for approximately five minutes, after which the powder passes through a cooling process and is then ready for packaging. The proponents of the process also claim that the process releases no toxins, by-products or contaminants. The reactivated rubber may then be compounded and processed to meet specific requirements. Currently Rebound Rubber Corp., which holds the North American license for the AMR Process, has built a rubber reprocessing plant and research/quality control lab in Dayton, Ohio. The plant performs production runs on a demonstration basis or at small commercial levels. The recycled rubber from the Ohio plant is currently being tested by an independent lab to establish its physical and chemical properties. Whether or not the AMR Process succeeds, the market for new raw rubber or equivalent remains enormous, with North America alone using over 10 billion pounds (approximately 4.5 million tons) every year. The auto industry consumes approximately 79 percent of new rubber and 57 percent of synthetic rubber. To date, recycled rubber has not been used as a replacement for new or synthetic rubber in significant quantities, largely because the desired properties have not been achieved. Used tires are the most visible of the waste products made from rubber; it is estimated that North America alone generates approximately 300 million waste tires annually, with over half being added to stockpiles that are already huge. It is estimated that less than 10 percent of waste rubber is reused in any kind of new product. Furthermore, the United States, the European Union, Eastern Europe, Latin America, Japan and the Middle East collectively produce about one billion tires annually, with estimated accumulations of three billion in Europe and six billion in North America. Rubber has many uses. Most industrial uses are in vibration control and dampening used in automotive components such as stabilizer bushings, jounce bumpers, and motor mounts. Rubber is also used to dampen blows from interlocking equipment and creating seals. Rubber is also used in tires for vehicles. This page was last modified on 20 July 2015, at 21:22.